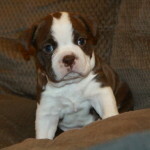 Boston Terrier puppies are extremely adorable as both puppies and adults. 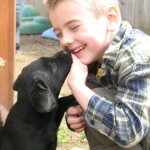 They are known for being happy, friendly and gentle dogs. 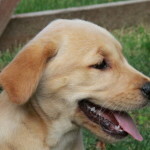 They are easily trained by a patient owner and they are also very protective of their families. 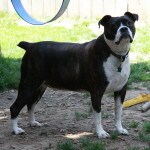 Boston Terriers should weigh between 10-25lbs full grown according to breed standards and should be marked with white in proportion to either black, brindle, seal, or a combination of the three. They have a short muzzle, erect ears and a short tail. 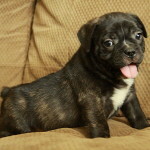 They are not known to be barking dogs, which makes them excellent choices for those in apartments. 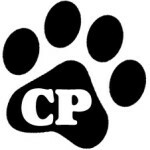 Having been bred as a companion dog, they love to be around people, and when properly socialized at a young age, they get along well with children, the elderly, other dogs and other pets. 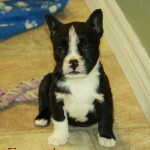 When looking for Boston Terrier puppies for sale, it is important to ask a few questions before visiting, as they have such a sweet temperament that you will easily fall in love! They should always be well socialized, had proper vet care at age appropriate times, and not be fearful or cowering. 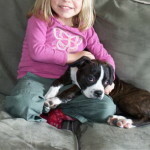 The Boston Terrier puppy should be very friendly and out-going, and should never be rehomed before the age of 8 weeks minimum. 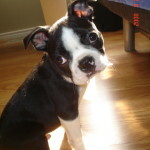 Boston Terriers have incredibly amazing personalities and will need lots of attention whether from family members or another pet. They will not enjoy overly large amounts of time left alone. 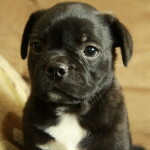 There are a few popular Boston Terrier cross or mix puppies that also make amazing pets. 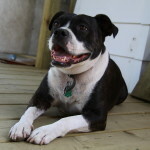 Our family personally has a Boston Terrier x Beagle dog, Buster, who was born in 2007 and has been a wonderful addition to our home. He’s “Uncle Buster” to the puppies we have here and does a great job of socializing them with older/larger dogs and teaching them what’s acceptable and what’s not! 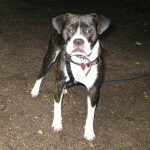 The Boston Terrier x Beagle, also known as a boggle or boglen, is a wonderful family pet, very alert and active and needing regular exercise and attention. 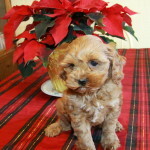 They are extremely sociable and loving and will take as much love and attention as they can get! 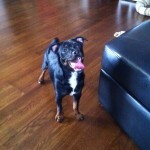 The Boston Terrier x pug dog, also known as a Bugg, is also a really fun-loving dog, with great personality! 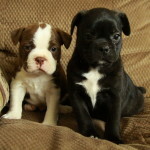 The Boston Terrier is already such an amazing dog, and then add the funny temperament of a pug, and you have a great mix! 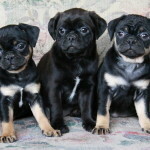 The Bugg can be a variety of colours and varies from small to a heavier dog, depending on which parent it takes after the most. They should also be well socialized from a young age, never rehomed before 8 weeks old, always have all vet care up to date, and be loved, loved, LOVED! This will make for a perfect addition to your home. The only downside, if you can call it one, is that they do shed and are not considered to be hypo-allergenic, so they would not be suitable for allergy sufferers. 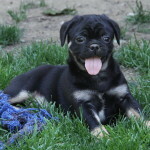 But if you are looking for a little more life, excitement and/or laughter in your home, a Boston Terrier x pug may be the perfect choice for you! 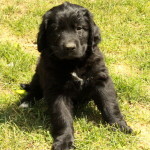 Though all puppies are extremely cute, make sure your choice of puppy is a well thought out decision as your new family member will be with you for 10+ years! 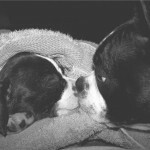 We always want our Boston Terrier or Boston Terrier cross puppies, or any puppy adopted, to be in their forever home from the start, so please consider everything you need to know ahead of time. 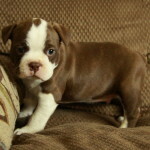 Never buy a Boston Terrier (or cross) puppy as a gift or surprise from someone, and those advertising Valentine’s Surprises, Christmas surprise or birthday surprises are not likely having the best for their puppies in mind. Also make sure you always receive the original vet paperwork with needle(s), deworming names and dates, as well as a written health guarantee with all contact information from the original owner before leaving. We never recommend you meet someone ‘halfway’, in an apartment lobby, parking lot, or anywhere else that is not a home location. 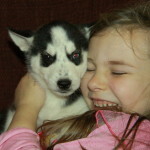 This can be dangerous for you, and is a good sign the puppy has not been well bred and/or cared for. 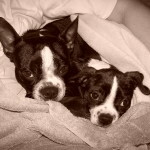 Do your research, be safe, and give your new Boston Terrier or Boston Terrier cross puppy the best home ever!